Preston Market first opened back in the 1800's. But with the high street, supermarkets and superstores taking increasing levels of trade over the years, local markets have struggled to compete. 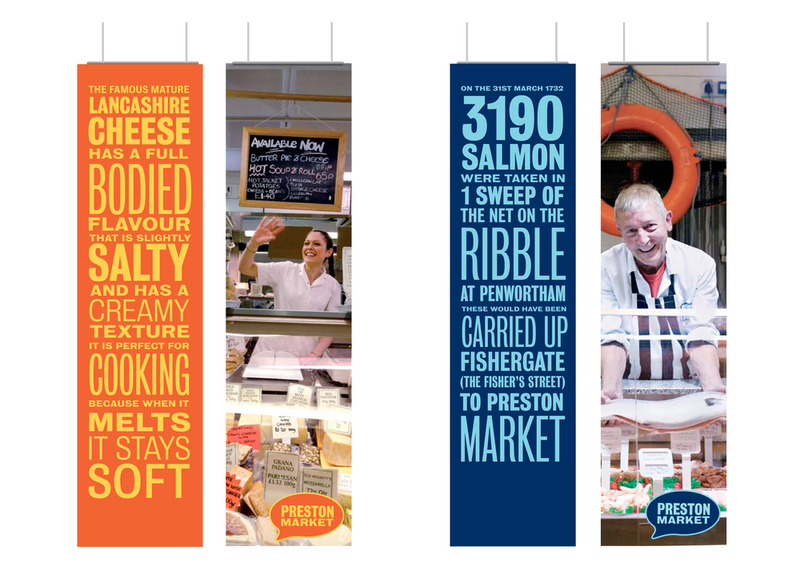 Preston Council approached us to help breathe life back into the market and encourage people back through the doors. What really stood out were the people, the passion and the personalities of the market traders. Intricate knowledge of their products and a desire to share this with their customers gives them something that supermarkets can't compete with. The identity we created brought all of this to life, reflecting the characters, conversations, hints and tips that sit at the heart of the market. The new branding was applied across internal and external signage, bringing some vibrancy back into the market hall. Outdoor advertising across the city supported the campaign outside of the market doors. We continue to work with the market today, keeping the spirit alive.